Develop dexterity, problem-solving and reasoning skills, hand/eye coordination, colour, shape, size identification, and more with these big, bright, multicolored wooden jigsaw puzzles. The pieces are light in weight, large in size (about 3/4 in. thick for easy handling), and interlock loosely so even pre-schoolers can assemble them easily. All are precut, safe, sturdy, and water-resistant. The colours are non-toxic stain-like impregnated finishes. The Worm is approximately 5 in. high, 18 in. wide, and is Multi Coloured. 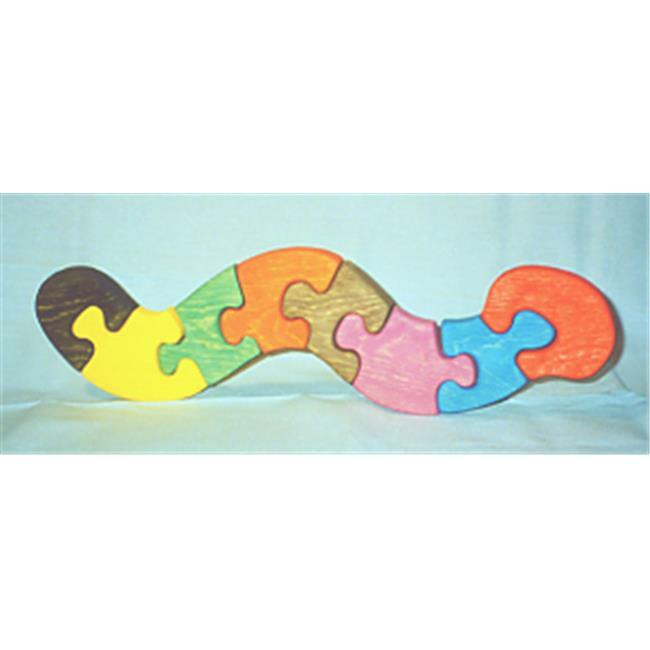 THE PUZZLE-MAN TOYS Our wooden toys are created for the safety and education of all. We started designing for young children, but soon found that every person in the family was the kid having fun. While having fun, learning skills are very apparent. These wooden toys help develop dexterity, hand/eye coordination, colour, shape, size identification, problem-solving and reasoning skills, plus many others. All of our jigsaw Puzzles are created without a frame to insert the pieces into, as most others are. We want the child to match and compare body parts that go together or structural shapes to each other, in order to reassemble each design. Not put a piece into a frame that matches the frame, having no consideration for the relationship of the components that make up the design. The grain of the wood plays an important part as all designs are cut from a solid piece of wood.